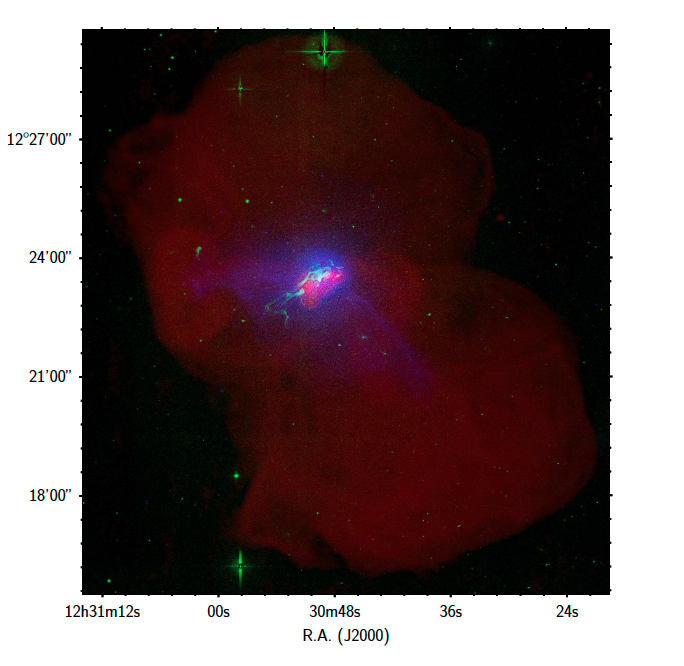 Portion of a SPIRou frame recorded for AD Leo, an active red dwarf located 16 light years away from us. Each group of three vertical bars corresponds to one spectral order, covering a small region of the overall spectral domain. The two left-most vertical bars of each order contain the spectrum of AD Leo (in two orthogonal polarization states) whereas the right-most one contains a Fabry-Perot spectrum. ©SPIRou team. 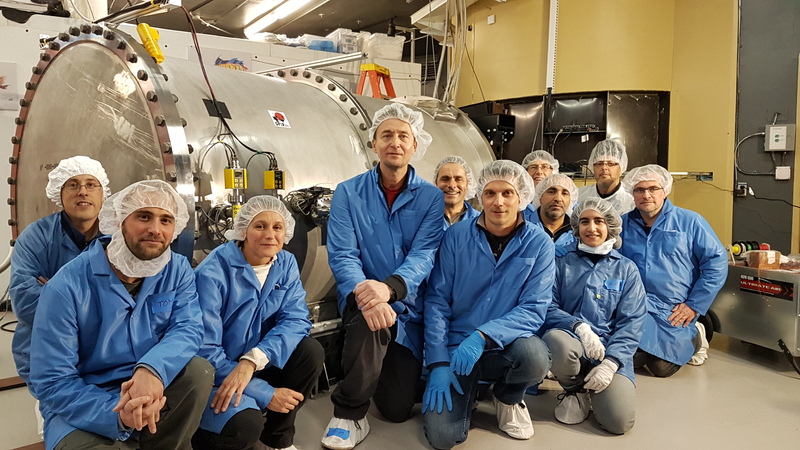 After 4 months of hard work by engineers and scientists from France, Canada, and CFHT, and over a decade in the making, an important milestone has been reached for SPIRou, CFHT's new planet hunting spectropolarimeter. On April 24th around 7:50 pm Hawaii time, the instrument recorded, for the first time, light coming from a star through the telescope and the various fiber-linked SPIRou components. During the following few nights, SPIRou gathered an impressive collection of about 440 spectra of 24 stars, while demonstrating a few of its unique capabilities in the process. SPIRou (SpectroPolarimètre InfraRouge) is a high resolution spectropolarimeter and a high precision velocimeter optimized for discovering Earth twins orbiting in the habitable zone of nearby red dwarf stars and exploring fledgling stars and their planetary systems in the making. Before coming to CFHT, the instrument was integrated and intensively tested at L'Institut de Recherche en Astrophysique et Planétologie (CNRS/Université Paul Sabatier) and the Services Communs de l'Observatoire Midi Pyrénées (CNRS/UPS/IRD/CNES/MétéoFrance), Toulouse,France; after demonstrating its performances through in-lab testing, SPIRou was disassembled, packed, shipped and reassembled at CFHT. The components of the spectrograph were repositioned on the instrument's optical bench to a precision better than the width of a human hair. During this first on-sky exercise, SPIRou observed stars cooler than the Sun known as red dwarfs, a stellar population comprising most of the stars in the neighborhood of our Solar System. An upcoming large program using SPIRou will closely observe nearby red dwarfs looking for evidence of nearby planetary systems. The first star observed with SPIRou was AD Leonis, a very active red dwarf located 16 light years from Earth in the constellation of Leo. AD Leonis is known for its strong magnetic fields and hugely energetic flares. "AD Leonis is very famous for being an active star with large radial velocity variations and a known magnetic field. That makes it a perfect target for the first SPIRou observations. We're observing AD Leonis to determine if the data we observe with SPIRou matches the known results on the star" explains Claire Moutou, astronomer and SPIRou instrument scientist at CFHT. SPIRou indeed demonstrated its ability at detecting the magnetic field of AD Leonis. SPIRou also observed hot stars known as "telluric standards", stars whose spectra contain mostly telluric lines from the Earth's atmosphere. As an infrared instrument, SPIRou is particularly affected by telluric lines. Identifying the telluric spectrum is essential to determine which features of SPIRou's spectra are from the observed stars and which come from the Earth's atmosphere. The distinction is critical in revealing the presence of orbiting planets. Small portion of the SPIRou spectrum of the active red dwarf AD Leo as observed (w/ telluric lines, red) and once the telluric spectrum (green) is removed (blue). This illustrates how critical telluric subtraction is to properly identify which lines can tell us some information about the observed star, and the planets potentially orbiting it (©J.-F. Donati). 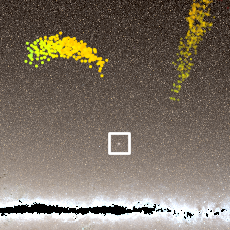 Circular polarization (red) in the spectral lines of AD Leo (green) reveals the presence of magnetic fields at the surface of this active red dwarf (©J.-F. Donati). SPIRou uses a technique known as "velocimetry", radial velocity measurements coupled with polarimetry in the infrared, to detect the tiny wiggle in a star indicating the presence of planets to very precise levels. "We anticipate the astronomy community will use SPIRou extensively in the following decade," says Jean-Francois Donati (CNRS), the principal investigator of SPIRou and leader of the SPIRou science team. "SPIRou will play a key role in the coordinated exoplanet surveys to come involving multiple space-based missions like the recently launched TESS, and the upcoming James Webb Space Telescope and the future PLATO." After being delivered at CFHT in January, SPIRou was installed at its new home location on the third floor of CFHT, and reassembled by engineers and specialists from SPIRou partners namely IRAP (CNRS/UPS), Institut de planétologie et d'astrophysique de Grenoble (CNRS/Université Grenoble Alpes), Laboratoire d’astrophysique de Marseille (CNRS/CNES/AIx-Marseille Université), Institut d’Astrophysique de Paris (CNRS/Sorbonne Université), National Research Council Herzberg (Victoria, Canada), Observatoire du Mont-Mégantic (OMM), Université de Montréal (Montreal, Canada), with invaluable support from the whole CFHT team. The instrument was then cooled down for the first time at CFHT to verify alignment of the optical components and conduct engineering tests. Cryocooled to a temperature of 200°C below freezing, SPIRou is thermally stabilized to a level a thousandth of a °C to be able to detect the tiny signatures that planet encode in the light from their host stars. The instrument was then warmed up to implement its brand-new science-grade 4kx4k detector from TIS, following its detailed characterization by the OMM and Université de Montréal teams, and to refine the alignment, before being cooled down again for a new testing session. The detector, a Hawaii 4RG or H4RG was fabricated by Teledyne, tested and assembled at the Université de Montréal before being shipped to CFHT. The H4RG is a new kind of infrared device that will greatly enhance the capabilities of SPIRou. The H4RG has 4k x4k 15 micron pixels which will be read out continuously to avoid increasing the detector's temperature. Preliminary tests show that the detector is of excellent quality. Part of the team of engineers from France, Canada, and CFHT, after closing up the SPIRou cryostat (in their back) for the first time in the CFHT coude room. The team also installed the 35m fluoride fiber that feeds SPIRou from its Cassegrain unit, mounted on the telescope and located at the fifth floor of CFHT. In parallel, they successfully tested this Cassegrain unit, providing image stabilization and guiding facilities at the telescope focus. The crucial test came on the first night of the commissioning run. Twenty-four stars were observed during the first commissioning run, which ran from April 24th to April 30th, starting the SPIRou collection with hundreds of exquisite spectra. "SPIRou is a unique and very powerful instrument. At the Institute for research on exoplanets, we are all very excited about the fact that it will find the closest habitable worlds from the Earth, the ones we will be able to study in more details with the James Webb Space Telescope." says Rene Doyon, SPIRou co-PI at Université de Montréal, director of iREx and OMM. Moving forward, commissioning of the instrument will be followed by Science Verifications and normal operations, including the main research topics that SPIRou was designed and constructed to accomplish. "A lot of work is still ahead for SPIRou, but we are encouraged by the results of the first commissioning run", says CFHT's director of science, Daniel Devost. "A sincere congratulations to the entire SPIRou team for the work they have put into this outstanding instrument." SPIRou was designed, funded and constructed thanks to a worldwide consortium of laboratories and institutes, namely IRAP (CNRS/UPS), Services communs de l’Observatoire Midi-Pyrénées (CNRS/UPS/IRD/CNES/MétéoFrance), Observatoire de Haute-Provence, Institut de planétologie et d'astrophysique de Grenoble (CNRS/Université Grenoble Alpes), Laboratoire d’astrophysique de Marseille (CNRS/CNES/AIx-Marseille Université), Institut d’Astrophysique de Paris (CNRS/Sorbonne Université) and CFHT. Press release from the Université de Montréal. Communiqué de presse francophone de l'Université de Montréal.